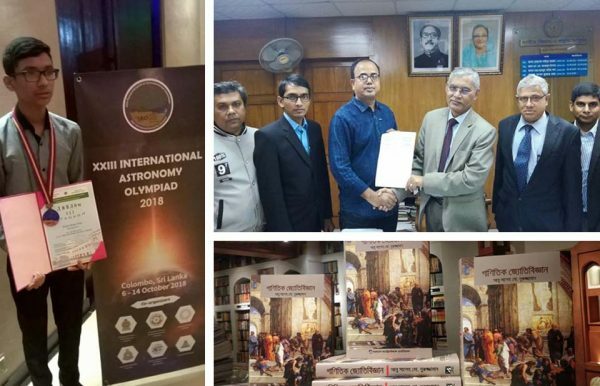 Top 5 will participate in 24th International Astronomy Olympiad 2019 in Romania and next 4 place will participate in Asian-Pacific Astronomy Olympiad 2019. Top 2 participant from university / college level competitors will get scholarship from Russian government to study about astronomy in Russia. Registration must be completed within 20 May 2019. Dhaka, Chattogram, Noakhali, Kumilla, Sylhet, Mymensingh, Rangpur, Rajshahi, Bogra, Narayanganj, Gazipur, Khulna, Feni, Sirajganj, Jessore and Barishal. Pallab Kanti Paal from Bangladesh won Diploma lll / Bronze. 13 October 2018, Michail Gavrilov, Chairman, IAO distributed medals among the winners of this Olympiad held in Colombo, Sri Lanka. For organizing the National Science and Technology Museum Astro-Olympiad 2019 the agreement memorandum between Bangladesh Astronomical Association and National Science and Technology Museum was signed on 24 January 2019. Note: The rights of any change, extension and cancelation regarding the National Science and Technology 14th Astro-Olympiad 2019 are protected by Bangladesh Astro-Olympiad National Committee.